← Who judges the federal judges? Why won’t the IRS prosecute President Trump for tax fraud? There are two possible reasons. 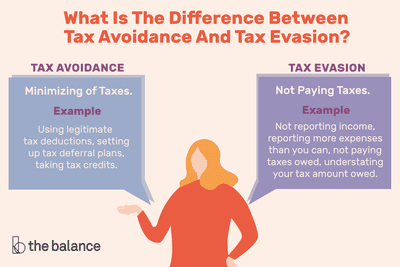 One is that the distinction between tax evasion and tax avoidance is not always clear. (See image below.) The other is the six-year statute of limitations, which protects big-time tax evaders/avoiders like Trump. More here, via Irina Ivanova at CBS Money Watch. 1 Response to Why won’t the IRS prosecute President Trump for tax fraud? The IRS can look back as far as they want civilly. For those who think they are better off not filing a return, the statue of limitations does not begin until a return is filed. But once filed the IRS can only go back 3 years for an “error”. I have found there is a direct relationship of income to tax avoidance. The higher the income, the greater the attempt to avoid. Some high income individuals become obsessed with the dollar amount they pay in taxes and will go to extreme maneuvers to reduce their tax regardless of their income. They claim they are within legal boundaries but when looked at objectively, it is fraud. The fraud is not caught because our tax laws are so damn complicated! Ask 3 IRS agents to look at a complex problem and you will get 3 different answers. So So So much falls through the cracks!!! It is extremely difficult to prove intentional fraud. Therefore, you only have to wait for the statute to expire.